Inside the SNU library. Photo by Jonathan Hane. 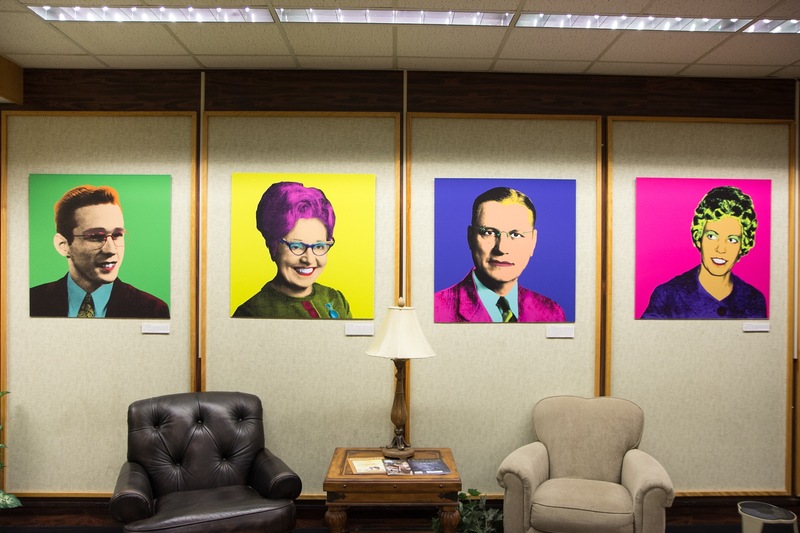 If you have been in the SNU Library this semester, you might have noticed some change already – the presence of 4 Andy Warhol-esque prints of people influential to this campus. You can recognize some of these people by their names as several SNU buildings carry their monikers: Don Beaver, Mrs. Cantrell, R.T. Williams and Wanda Rhodes. We in the Library loved that idea for several reasons – the color scheme is fun and the style is modern, both of which would bring some color and life into the Library lobby. However (warning, I’m getting deep here), we also really like the idea of holding on to the essence of what built this campus (dedicated people who were committed to SNU) while reinventing and changing the form that communicates that essence (updating the color scheme and style to challenge our preconceived notions of what dedication to SNU looks like). That principle – holding on to the essence but changing the form – is the very nature of what the SNU Library is doing this year and will be doing in future years. We are a library, which means we have print books, a checkout counter, physical items to organize, study spaces and research assistance available. However, we are a 21st century library, which means we have fun harnessing new technology, new teaching methods, new ways of organizing our space, new partnerships and new resources as best we can to better connect you, the students, staff and faculty of SNU, with the resources you need to succeed academically, personally and professionally. One new resource to which we are subscribing this year is ebrary, a digital library that features over 70,000 full text academic books, which will almost double the amount of books we have in the Library. You will be able to find, access, download, print and cite material from these ebooks anytime of the day or night. We hope access to these books will make research easier for all types of students at all times of the day or night (or early morning!). The other new piece of technology we are really excited about this year is Storm Search – a brand new way to discover all the resources the SNU Library provides. This new method of searching will replace Encore and will pull all of our online databases, ebooks and our online catalog together, so you can search everything we have from one place (hooray!). Additionally, Storm Search will make database recommendations based on your searches, will provide a seamless way for you to ask us questions without leaving your search and will deliver results to you in a simple, yet sophisticated, way. Both ebrary and Storm Search will go live on October 1, 2013 (next week!). We hope that you will find both of these changes exciting, but, most of all, we hope you will find them useful. As with any major change, I am sure there will be some minor glitches, but we hope you will be gracious and patient with us as we change the form of what we do while holding on to its essence – providing you all with fantastic resources.